Large multi-floor carriage house, perfect for large or extended families. This is a multi-unit offering allowing the use of one or 2 floors. Conveniently located near Okemo and along the Okemo Village Shuttle bus route. The larger second floor unit has 3 bedrooms, 2 baths, laundry, large fully-equipped kitchen, and dining and living areas. Bedroom 1 has a king size bed with memory foam mattress and en suite bathroom with a tub/shower combination. Bedroom 2 features a full size bed. Bedroom 3 contains a pair of twin size beds. Bathroom 2 features a tub/shower combination. There is a laundry room with full sized washer and dryer. The kitchen is fully equipped with full sized refrigerator, stove, dishwasher and microwave. The first floor has 1 bedroom, 1 baths, a large living area with large flat screen TV. The bedroom feature a full size bed and the bathroom features a tub/shower combination. The apartment is located on a hillside, with views towards the village. It is quiet and secluded, with plenty of parking. All linens, towels and basic supplies are provided. Owners are onsite and available as needed. The driveway is paved and maintained, but due to its steepness 4 wheel drive is highly recommended in winter months. Monthly and seasonal rentals are available, inquire for rates. Francis and Donna have been living in Ludlow most of their lives and have raised 2 children and now enjoy visits from their 4 grandchildren. They enjoy tending to their large vegetable and flower gardens in the summer months. Francis grew up nearby and spent hours of his childhood in the surrounding forests. He built their adjacent log home over 40 years ago. This property offers the convenience of being close to town yet is a secluded location with plenty of peace and quiet. 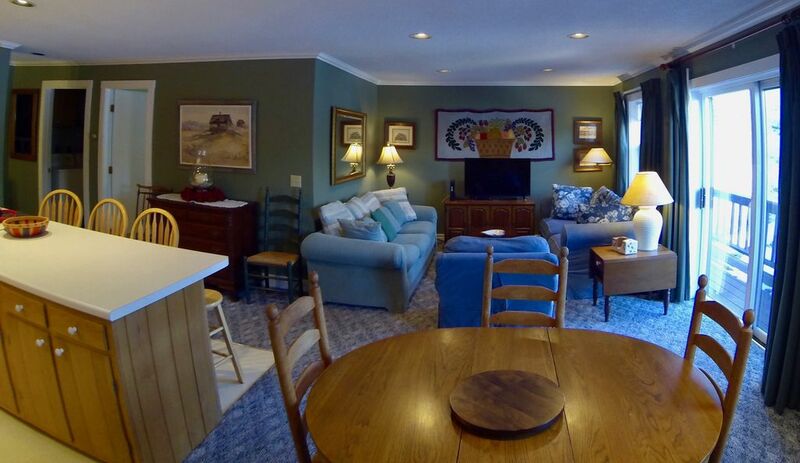 Secluded and private wooded setting, yet close to village and amenities. We had excellent time in the house during our ski trip to Okemo. The house is very spacious with plenty of rooms for big/multiple families. The kitchen was well equipped with electric range, microwave, dishwasher, coffee machine and plenty of dishes, mugs and utensils. It was rather cold outside but warm and cozy inside the house. Very close to Okemo Ski area and village shops and restaurants. The owner warned us that the driveway to the house is pretty steep and could be icy so it is more suitable for AWD cars. We had AWD sedan and SUV and there were no problems. The property was as advertised. Clean with great amenities and super close to town and the mountain. Very quick response when we had trouble with the wifi. Would stay again! Thanks!! Excellent stay, one to remember and cherish for long! From the time of the booking till the time we left, it was a very pleasing and comfortable experience.The owner family is very welcoming,generous and assisted in all our questions and services needed.Thank you Donna for coming down and greeting us. All the kids enjoyed to the max and had a great time for the limited stay we had at the house.The house was fully loaded with all the amenities and luxury. It is very clean,neat and beautiful indeed! Close to the gas station and a supermarket made things more easy. Thanks Joe once again for your prompt replies and detail explanation.Will look forward to stay again in offing,if we ever planned to visit there.Had a great time. Appreciate for your time and effort in listing out the places of interest. We had a very nice weekend at this house in Ludlow. The house had 5 bedrooms which was plenty of space for our group of 8 people (would have easily fit 10). The house was very clean and nicely decorated. The house has multiple common areas, two downstairs and one upstairs, where people could spend time. There's also a ton of books and board games which was a nice touch. The kitchen was fully equipped and there was enough space to serve meals for larger groups. The people who own the place are very nice and came over to greet us. They gave us fresh eggs from their hens which were delicious. Joe was also very easy to work with and made the whole process very easy for us. Can't say enough good things about this house! A very beutiful house, well kept and equipped with everything needed. Owners are wonderful people . They surprised us with a dozen eggs from their hens on the property. Well maintained house and though the druveway was a bit steep , it was kept sanded and salted. Beautiful views all around and close to Okemo. Will return over summer. Only minutes from Okemo Ski Resort and the Okemo Valley Golf Club, this is the perfect location for skiers and golfers. Village restaurants and amenities are close by yet the secluded location offers privacy as well as peace and quiet. No smoking, no pets, 4WD / AWD vehicle required during winter.